This custom-built Montana log home offers a million-dollar panoramic view of the Steamboat ski area and surrounding valley. Mountain High Chalet is conveniently located close to the Thunderhead Express high-speed quad lift allowing you rapid access to the mountain trails or easy access to the mountain village and the rest of Steamboat Springs by complimentary on-call shuttle service during the winter. 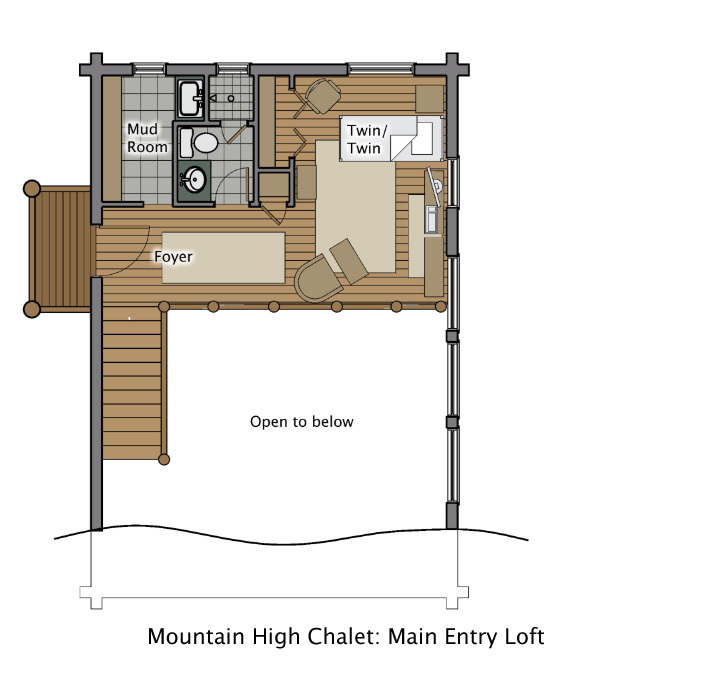 Mountain High Chalet sits atop a ridge in a quiet mountain neighborhood which enables you to relax in the private hot tub while taking in the incredible view. However, you are only a short ride away from world-class skiing and the quaint mountain life of downtown Steamboat Springs. While in the home, you’ll feel comfortable with the beautifully finished, hand shaped logs that create a cozy living area centered in front of the warm stone fireplace. 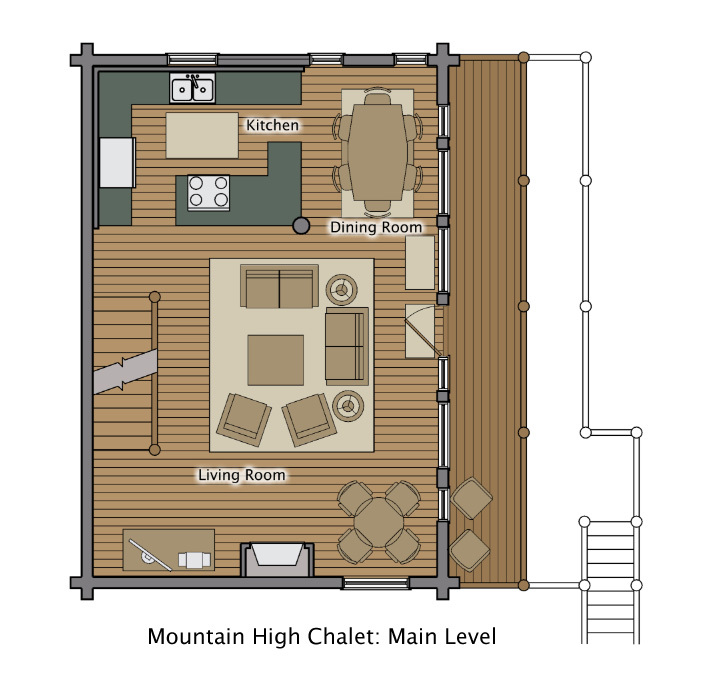 The Great Room with high ceiling and loft shows off the fine craftsmanship of the chalet construction and gives you plenty of space to enjoy time together with your friends and family. The kitchen is fully equipped with everything you’ll need to prepare a sumptuous feast or a snack after a day out enjoying the mountains. Or, perhaps treat yourself to a special meal prepared by one of our chefs, who love this home. Once dinner is prepared, sit down at the dining table that will comfortably seat eight guests. The incredible views form the perfect backdrop for a memorable dinner while the alpenglow lights up the mountain. It’s also the perfect location to watch fireworks when we have special events at the mountain. 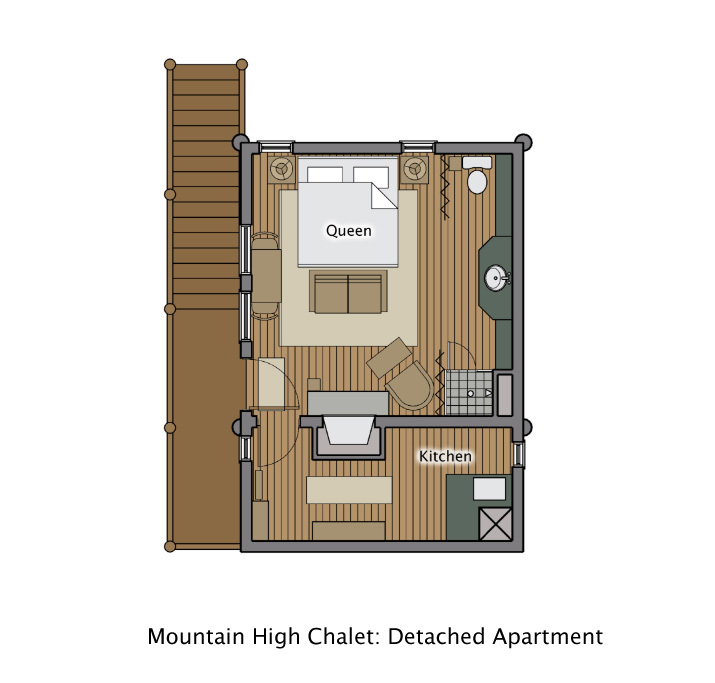 Mountain High Chalet offers 3 charming bedrooms and baths in the main house. The master bedroom has a King bed and large ensuite bathroom. There is access directly to the lower deck and hot tub to take in those incredible views first thing and last thing in your day. 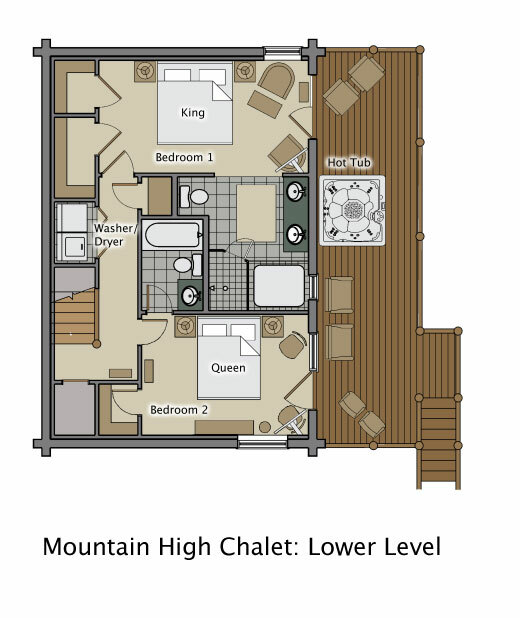 On the lower level, there is also a Queen bedroom with ensuite bathroom and access to the deck. In the loft, you’ll find a twin over twin bunk bed and private bathroom. Along with the main house, there is a detached apartment above the garage with a Queen bed. This private space offers a queen bed, cozy fireplace, bathroom and kitchenette. The chalet offers ample outside deck space to enjoy one of the most spectacular views in Steamboat with a 180-degree view across to the Flat Top Mountains and over to the Steamboat Ski Area. This is the same incomparable view that you can enjoy from the hot tub on the lower deck. PLEASE NOTE: This home is located in a mountainside neighborhood which gives you spectacular views all around. In winter, the road is plowed regularly but 4WD and snow tires/chains are essential if you intend to bring a car. If it snows (which it does a lot) you will need to pay attention in the driveway which is steep and without guardrails. We recommend taking advantage of our complimentary on-call private shuttle to avoid the need for a rental car. It is advised you leave your vehicle at our office. The ski shuttle offers super-easy access from your vacation home to the ski trails and anywhere else in Steamboat. We enjoyed the chalet for the week we rented. The home is cozy and lends itself well for a big family gathering. The views were incredible so we spent a lot of our time on the deck. The town itself is close enough that running to the store is easy as well as getting to town to shop or eat out. Of course the recreational opportunities were fabulous and we certainly took advantage of the fun. Moving Mountains were helpful and courteous. We love any time we spend out in steamboat. This house did not meet our expectations sadly. The driveway to the home is very very dangerous in the snow, as it is very steep in addition to the fact that it's inches away from a cliff. The house was listed as a 3 bedroom with guest cottage above the garage, however the house truly only has 2 bedrooms. The 3rd bedroom is a bunk bed literally right when you walk into the front door of the house. You enter the home into the loft of the log cabin and there is a mud room and bunk beds. Not very user friendly for privacy for kids or adults. The 2 bedrooms on the bottom level were great! Very spacious and confortsble! The views from the home are great of the mountains, although I would most likely not come back to ''tis property again. Our family has stayed at Mountain High Chalet 3 times over the last 10 years. It has one of the best views of the mountain and is a great size for one family. Very comfortable and if you get the Catered Chalet package you will have an unbelievable vacation! Thanks Chef Renee' and Chalet Host Scott and thanks Moving Mountains owners Robin & Heather Craigen! We'll be back!